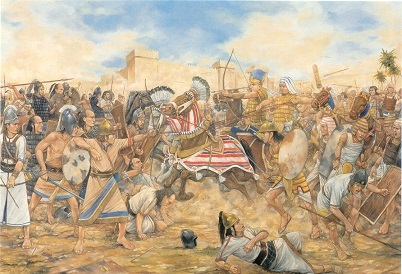 Battle of Megiddo (ca. 1457 B. C.) - A campaign conducted by Pharaoh Thutmose III in the Levant. Thutmose was one of Egypt's greatest conquering pharaohs, having never lost a battle. At the time of Megiddo, Canaan was under the control of Egypt, but had rebelled and tried to break away. The rebellion was led by the kings of Kadesh and Mitanni, but Thutmose crushed it and expanded his territory even further north. We know about the battle because it was recorded by Thutmose's military scribe, Tjaneni, on the walls of the Temple of Amun-re at Karnak.